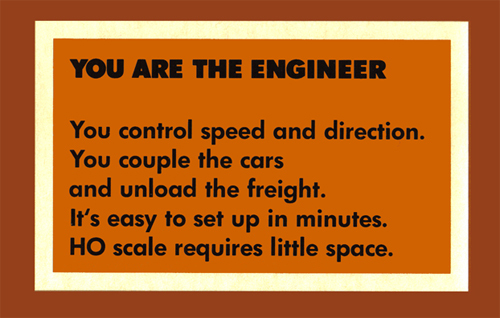 Not among the cataloged TYCO Caboose models. This CN Extended Vision Caboose was produced for the Canadian market. 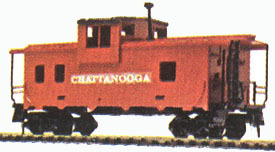 The first Chattanooga example pictured above represents TYCO original catalog image for the model and doesn't correspond to production run examples. 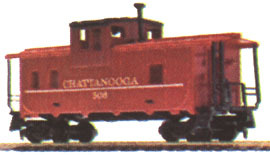 The typical wide vision Chattanooga is seen second and includes a white horizontal stripe along the body and the roadnumber 506. Also shown is the TYCO box flap demonstrating the 328 stock numbering. 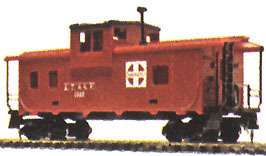 TYCO did not refer in its catalogs to the wide vision model of the caboose with the 328 series, but used the same 327 number as found on the streamline cupola model. 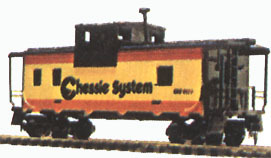 The wide vision Chessie System caboose is lettered for C&O and carries the roadnumber 3323. The Extended-Vision Cupola Chessie System Caboose is lettering for C&O and carries the roadnumber 3323. The wide vision model decorated for Santa Fe has examples that bridge TYCO's switch from a letter at the end of the stock number to the later dash-digits system. The numbering system change occurs in the mid-'70s. 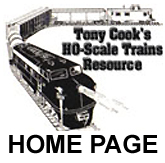 In the years since TYCO's departure from the model train market, IHC (International Hobby Corp.) has issued new versions of the tooling for the Wide Vision Caboose model. This former TYCO model is among the ex-TYCO items that now reside with IHC. Below is a Gulf Mobile & Ohio decorated example from an IHC run. The IHC Wide Vision Caboose is not currently available, but has been a staple of the company's product line for many years.